Each month we have a snack of the month that we are able to share with our clients and have samples in the waiting room. 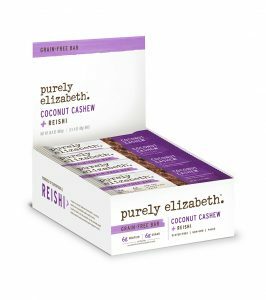 This month we are excited to share the coconut cashew, purely elizabeth, Grain-Free Superfood Bar. The coconut cashew, purely elizabeth, Grain-Free Superfood Bars are gluten free, non-GMO, and vegan. Besides coconut cashew, there are three additional flavors: banana nut butter, peanut butter, and chocolate sea salt. In addition to making delicious snacks, purely elizabeth also has lines of granola and oatmeal and has plans to roll out a few more items in June 2019. The best part, though, may be the inspiring story of entrepreneurship, which you can check out here. Purely elizabeth promotes natural foods and supports active, healthy lifestyles and a clean environment. Purely elizabeth strives to create value for society and has made donations to Slow Food USA, Wellness in Schools, the Fruit Tree Planting Foundation, Charity: Water, and the Rodale Institute. You can also follow them on Facebook, Twitter, Pinterest, and Instagram.